Here’s an “eye-popping” fact: The USDA estimates that 80% of insect crop pollination is accomplished by bees. Scientists consider bees to be a keystone species. They are so important to an ecosystem that it will collapse without them. 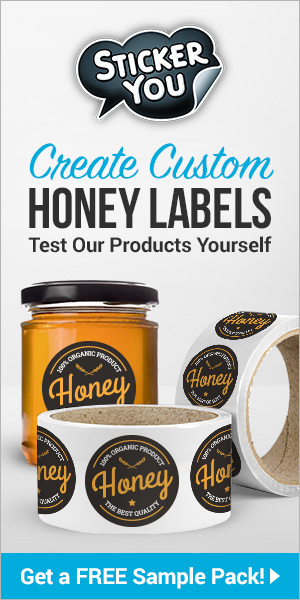 At least 90 commercially grown crops depend upon bee pollination for survival. How important is the pollination by bees? Ask an almond grower. Without bees, there would be no almonds. Apples, blueberries, cherries, avocados, cucumbers, onions, grapefruit, oranges and pumpkins would also disappear. Bees are the undisputed champions of the pollination world. And their secret weapon? Sight. Like us, bees are trichromatic. That means they have three photoreceptors within the eye and base their color combinations on those three colors. Humans base their color combinations on red, blue and green, while bees base their colors on ultraviolet light, blue and green. This is the reason why bees can’t see the color red. They don’t have a photoreceptor for it. They can, however, see reddish wavelengths, such as yellow and orange. They can also see blue-green, blue, violet, and “bee’s purple.” Bee’s purple is a combination of yellow and ultraviolet light. That’s why humans can’t see it. The most likely colors to attract bees, according to scientists, are purple, violet and blue. Bees also have the ability to see color much faster than humans. Their color vision is the fastest in the animal world-five times faster than humans. So while we may have trouble distinguishing one flower in a group from another, bees don’t. They see each individual flower. Some flower petals appear to change color, depending upon the angle. This is known as iridescence. It’s often in the UV spectrum, so we can’t see it. But, bees can. They see these shiny petals and associate them with sugar. Thus, the flower becomes more attractive to the bee and gets pollinated. When we drive on a highway and look out the window at the flowers by the roadside, we usually can’t distinguish one flower from another. The car is moving so fast that the flowers blend in to one another and we see a blur of color. Bees have a far higher “flicker” threshold. They can see individual flowers while traveling at a high rate of speed. Because of this, they actually respond better to moving objects than stationary ones. That’s why honey bees have no trouble pollinating moving flowers. That’s also why it’s rather useless to try swatting a bee-it has no trouble avoiding moving objects. Flying helps bees see better. They can see depth and they can see three dimensionally. They can also judge distance. They communicate these distances and directions of good foraging sites to the hive through their waggle dance. However, scientists have found that it is possible to trick bees into misjudging distances. In one study, a tunnel was painted in a semi-checkered pattern. When the bees passed through it, they became confused regarding the distance of the tunnel. The checkered pattern caused them to think the tunnel was longer, because they thought they were passing by a lot of objects. When the scientists painted horizontal stripes in the tunnel, the bees flew too short. Because of the lines, they couldn’t judge that they were passing by any objects. Thus, scientists realized that bees use the objects they fly by to judge distances, which they later communicate to the hive. 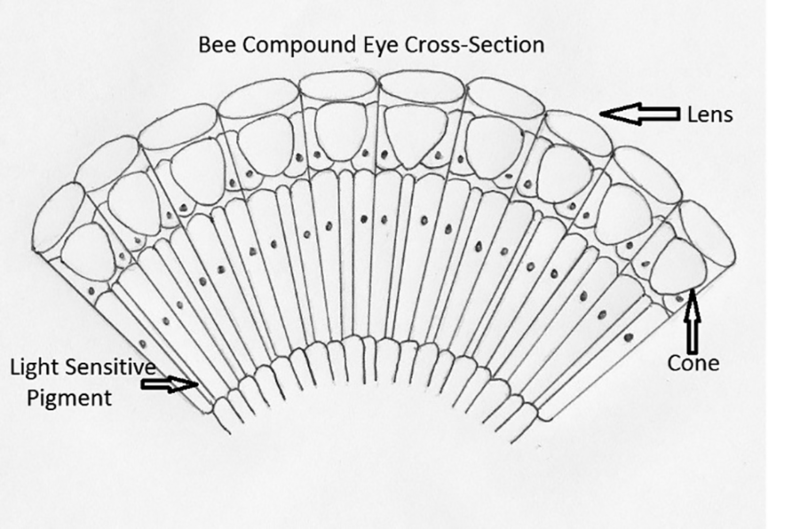 Bees have two different types of eyes-each with separate functions. 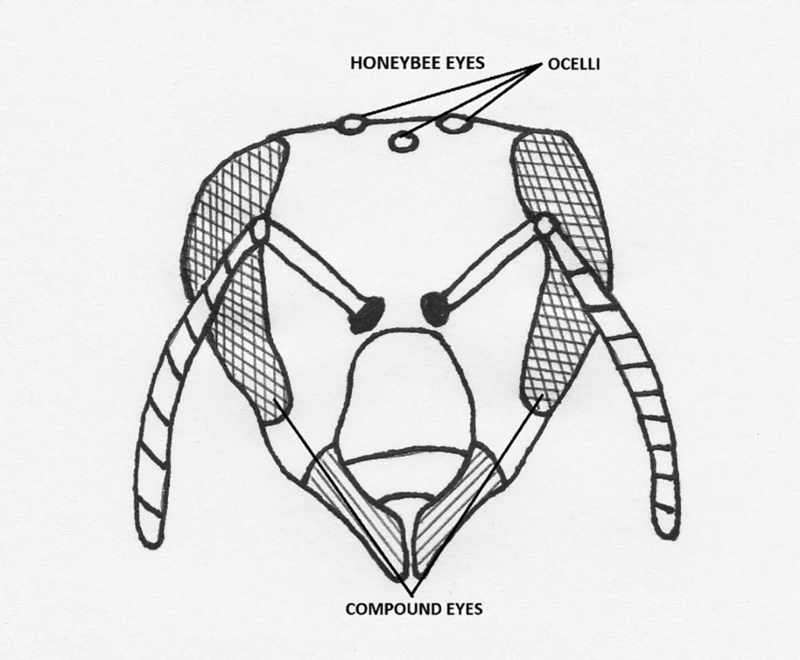 The three smaller eyes in the center-top of a bee’s head are called ocelli. Ocelli comes from the Latin word “ocellus” which means little eye. These little bee eyes have single lenses and help the bee maintain stability and navigate. They enable the bee to judge light intensity and stay oriented. Using these ocelli, bees can gather light and see ultra-violet light, helping them to detect UV flower colors. If a bee were a superhero, its sight would be its super power. 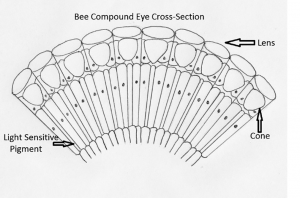 Every bee has two large compound eyes. These eyes are amazing examples of nature’s engineering. A compound eye is made up of thousands of tiny lenses called facets. Each of these facets takes in one small part of the insect’s vision. The bee’s brain then converts these signals into a mosaic-like picture made of each image. 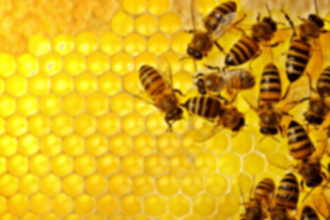 Worker bees have 6,900 facets in each eye, and drones have 8,600 facets. Every facet is connected to a tiny tube. Each of these units, called an ommatidium, contains a lens (facet), a cone of visual cells and pigment cells that help separate it from its neighbor cells. A bee is able to see color, because each of these tiny tubes contains eight cells that respond to light. Four of these cells respond to yellow-green light, two respond to blue light, and one responds to ultraviolet light. But a bee’s super sight powers go much farther than seeing mere colors. A bee can also detect polarized light. Polarized light moves in one direction. It’s caused when air molecules from the atmosphere scatter the photons to create a “super highway” of light. A bee’s amazing eye can scan and match the polarization patterns in the sky. It’s a bee version of GPS. They are able to use this polarized light as a navigating system. What makes this such a super power is that bees can use polarized light to locate direction even when the sun isn’t shining. They then communicate these directions to the colony. Basically, it’s a bee road-map. Bees can find their way back home by checking the pattern of polarized light in the sky. In very rare instances, people can see into the ultra-violet range. Usually, it’s after a lens injury or cataract surgery. This condition is called aphakia. People with aphakia see a “near” UV light. It is perceived as a whitish-blue or whitish-violet color. The French impressionist painter Claude Monet had this condition after cataract surgery. Before the surgery, his cataracts were so bad that his color range was limited to red and orange. After the surgery his paintings included deep purple and blue hues. Because of the bee’s extraordinary ability to see and navigate its world, researchers have made many attempts to create models that mimic a bee’s sight. The first “bee eye” cameras weren’t successful. They contained more than one camera, which caused them to be too heavy to use. Then, in 2010, German scientists were finally able to create a camera with a “bee’s eye view.” The key to this camera’s success was in using a combination of lenses and mirrors to create a bee’s 280 degree field of vision. The camera is tiny, with a diameter of only 23 millimeters. This “bee camera” will allow drone aircraft to “see” more of the world around them. It’s a small step in trying to mimic the bee’s very complex vision system. The contribution by bees to world economies is staggering. Researchers at the University of Reading calculated that bees contribute more to the UK economy each year than does the Royal family from tourism. 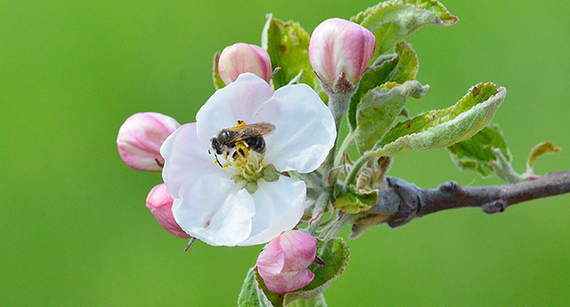 In the U.S., these super-pollinators are worth 14.6 billion dollars in crop production. With its incredible vision, a bee can pollinate plants with pinpoint accuracy. Windy weather and overcast skies are no match for its incredible sight. It can see what we can’t and because of that ability, it’s the ultimate pollinator. A bee’s sight is its super power. Why does it matter? Because bees matter. Barras, Colin. “Artificial Bee Eye Could Improve Robotic Vision.” New Scientist 207. 2773 (2010): 1. Dyer, Adrian G., and Jair E. Garcia. “Color Difference and Memory Recall in Free-Flying Honeybees: Forget the Hard Problem.” Insects (2075-4450) 5.3 (2014): 629-638. 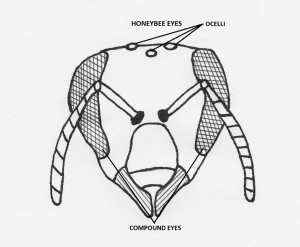 Kleist, T. “Bee Navigation: The Eyes Have It.” Science News 130.14 (1986): 214. Papiorek, S., et al. “Bees, Birds and Yellow Flowers: Pollinator-Dependent Convergent Evolution of UV Patterns.” Plant Biology 18.1 (2016): 46-55. Pennisi, Elizabeth. “Dance of the Deceived Bees.” Science Now (2001): 2. Srinivasan, Mandyam V. “Distance Perception in Insects.” Current Directions in Psychological Science (Wiley-Blackwell) 1.1 (1992): 22-26. Werner, Annette, Wolfgang Sturzi, and Johannes Zanker. “Object Recognition in Flight: How Do Bees Distinguish Between 3D Shapes?” Plos ONE 11.2 (2016): 1-13. Williams, Caroline. “Sense and Sense Ability. (Cover Story). New Scientist 211.2826 (2011): 32-37. Sharla Riddle is a retired educator and freelance author. She has been named a Huddleston Scholar, Tandy Scholar and RadioShack Science Chair.